The 1 90-foot-long towboat will be operated by The Valley Line Company between St. Louis and New Orleans. munication ; and single-hand radiotelephone for intra-company use. Deck winch controls located in the pilot- bouse. Radar, gyro and repeaters, Fathometer and automatic pilot steering. Diesel engine monitoring system with visual and audible alarms in push-button controlled air-conditioned engine control room, in the pilothouse and in the chief engineer's quarters. Lighter schematic panels in engine control room to show condition of fuel oil, bilge pump- ing and ballast water systems. Remote pump and valve controls for fuel transfer and pump- ing bilges will be mounted in these panels. Automatic generator load transfer system and alarms. General alarm system of bells in crew's quar- ters, officers' quarters hallway, aft upper engine room, forward lower engine room and galley. The heating-cooling system for living quar- ters will employ water from a 500,000 BTU oil-fired boiler or cooling water from a liquid cooler. Air-conditioning and heating systems are designed to maintain optimum tempera- tures in living areas. A forced ventilation sys- tem will 'supply positive pressure in the engine room. Engine air will be supplied directly from the outside. 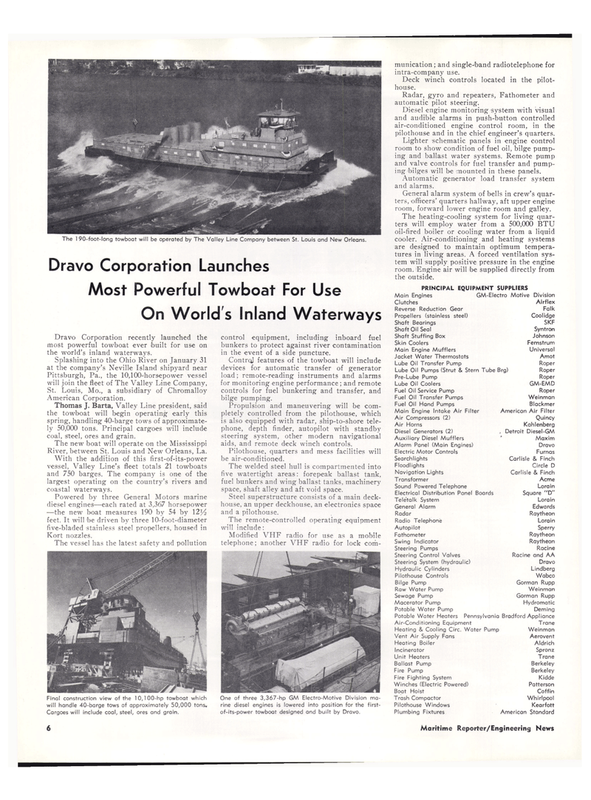 Dravo Corporation recently launched the most powerful towboat ever .built for use on the world's inland waterways. Thomas J. Barta, Valley Line president, said the towboat will begin operating early this spring, handling 40-barge tows of approximate- ly 50,000 tons. Principal cargoes will include coal, s'teel, ores and grain. River, between St. Louis and New Orleans, La. With the addition of this first-of-its-power vessel, Valley Line's fleet totals 21 towboats and 750 barges. The company is one of the largest operating on the country's rivers and coastal waterways. Final construction view of the 10,100-hp towboat which will handle 40-barge tows of approximately 50,000 tons. Cargoes will include coal, steel, ores and grain. control equipment, including inboard fuel bunkers to protect against river contamination in the event of a side puncture. Control features of the towboat will include devices for automatic transfer of generator load; remote-reading instruments and alarms for monitoring engine performance ; and remote controls for fuel bunkering and transfer, and bilge pumping. Propulsion and maneuvering will be com- pletely controlled from the pilothouse, which is also equipped with radar, ship-to-shore tele- phone, depth finder, autopilot with standby steering system, other modern navigational aids, and remote deck winch controls. Pilothouse, quarters and mess facilities will be air-conditioned. The welded steel hull is compartmented into five watertight areas: fore peak ballast tank, fuel bunkers and wing ballast tanks, machinery space, shaft alley and aft void space. Steel superstructure consists of a main deck- house, an upper deckhouse, an electronics space and a pilothouse.